As a prelude to the following anecdote: I love music, as in looooovvvvvvvveeeeee music. I play a little guitar and keyboard, but would describe myself only as an amateur at best. It’s not even a hobby, really, it’s just something that I fiddle about with if I have a spare moment or two. I know even less about computers (that’s relevant, I promise). 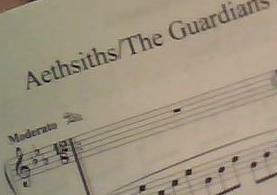 Music features heavily in my current series of books, The Guardians of the Path, (computers do not) and I got this idea for the covers of the books: what if I had a song and put a few bars of it on the back of each, so when you laid the books together you would get the whole song? Brilliant, right?! So, I wrote a little ditty on my keyboard, then I just had to figure out a way to get it into written form on my computer. 1) Find and procure people who know stuff. 1) Fortunately for me, in my life I have many people who know stuff. One such person helped kick-start my endeavor with two words. The first was “USB”. Now, I don’t know much about computers, but I’m not a complete troglodyte. I know what a USB is and what it looks like; my keyboard didn’t have that. Upon my description of “a round hole”, I was provided with the word “MIDI” (for the non-music people like me, that means Musical Instrument Digital Interface, or what you add to chlorians to endow mastery of the Force). 2) …with the new cable, though the keyboard could now be seen by my computer, I couldn’t make it work with the software. I was about to scrap the whole idea, thought about it, came close to deciding it wasn’t that important anyway – it can be easy to get frustrated when things don’t work. That never helps. Ever. So – think positive! Never give up, on yourself or your dreams. Decide that it’s all going to work out, even if everything is going wrong, and hold on to that. Be confident in yourself. If it’s going really, really badly, refer to #1 and be confident in someone else. 3) …make Magyc!! It’s not easy to describe how to make Magyc. It’s a different process for each person, and unfortunately the schools don’t cover what to do if you have no inherent magic talent. You’re just pretty much screwed. If you have magic talent, but don’t inherently know what to do with it, you’re also screwed. Very few people are able to point a wand at something and make the right thing happen on the first go. It’s more an art, less a science. There’s no hard and fast recipe for sparkly-rainbow-golden-beams-and-unicorn-tears Magyc, no pseudo-Latin phrase you can say with the right inflection or formulation of strange and exotic ingredients simmered together under a blue moon to produce this ethereal thing. Trial and error is always fun. Trial and success is more fun. And I fully believe that if you try enough times, you’ll learn more and more of what you need to know in order to make your own unique brand of Magyc, which this world desperately needs. In the eternal words of David Essex, Michael Damian and Def Leppard, Rock on! Posted in Magyc, Music, Writing and tagged Aethsiths, anecdote, art, brilliant idea, Finale music, GOTP, Guardians of the Path, guitar, keyboard, Magyc, midichlorians, music, no dragons, optimism, people who know stuff, persistence, rock on, science, the Force, think positive, trial and error, trial and success, trials and tribulations, writing on January 31, 2015 by DragonBeck.